Something a little different for today: a book review! 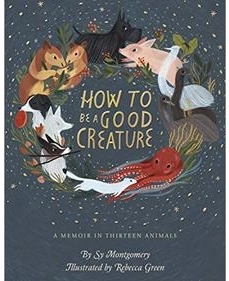 I bought this book, "How to Be a Good Creature" by Sy Montgomery, last week while I was spending some time with a girlfriend at a great local bookstore, M. Judson Booksellers. When I woke up earlier than anticipated on Sunday morning, I used that time to read it cover to cover in one sitting. A hardback with an invitingly illustrated colorful paper dust jacket and deckle-edged pages, its looks were what enticed me to pick up this book. I love a good memoir, and the description of this one made it seem likely to speak into my life as it is right now: mourning the loss of a child to suicide, figuring out what my purpose is now and how to be the mom my surviving child needs. “It ... explores vast themes: the otherness and sameness of people and animals; the various ways we learn to love and become empathetic; how we find our passion; how we create our families; coping with loss and despair; gratitude; forgiveness; and most of all, how to be a good creature in the world.” This book was exactly what I hoped.